Planar Monolithic Industries (PMI) recently introduced eight new products in their extensive line of RF and microwave components. The most interesting is the Feasibility Study on PMI RF Radar Sense & Avoid Systems for Small UAS (Unmanned Aerial Systems), i.e., a drone carrying radar. Also included are a couple 16-way power combiners, an EW receiver module, an and amplifier. Contact PMI today for more information. PMI Model No. RSAAS-001 is a Radar Sense and Avoid System that has been designed to provide obstacle detection for the 3DR SOLO drone. 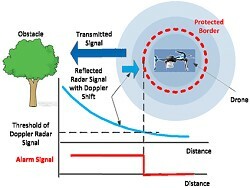 This system uses (four) Doppler shift sensors to detect obstacles from all sides of the drone allows obstacles from small size (such as a wire or a tree branch) to large (such as a wall) to be detected when in range mechanical mounting can be adapted to fit other UAV platforms. 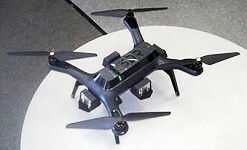 Low power requirements make this system ideal for UAV application. Each sensor has onboard adjustment for distance of detection communication with 3DR SOLO is accomplished over USB interface via 30-pin accessories port connector. Operating Current: 40 mA Typ. 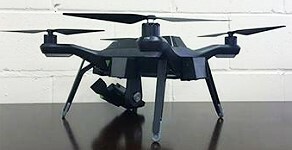 Mechanical Size: 12.8" X 7.2" X 1.9"
PMI Model No. 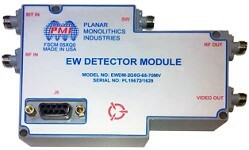 EWDM-2G6G-65-70MV is a CW immune EW detector module operating over the 2.0 to 6.0 GHz frequency range. This module features an internal switch used to switch between the "Bit In" and RF In" with input blanking on both ports. In addition, two amplified RF outputs are provided a 7 dB gain channel and a 33 dB gain channel. The video output is designed to drive a 150 ft. cable, while maintaining high speed, and excellent accuracy. PMI Model No. APD-16-0D5G18D0G-SFF is a 16-way, In-Phase Power Divider operating from 0.5 to 18.0 GHz. This model offers an insertion loss of 20 dB with over 14 dB of isolation. The phase balance is 9° maximum and the amplitude balance is 2.0 dB maximum. Features include SMA female connectors. Unit size is 19.00" x 10.06" x 1.73" (482.60 mm x 255.52 mm x 43.92 mm) with painted blue finish. PMI Model No. 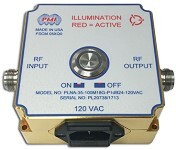 PLNA-35-100M18G-P1dB24-120VAC is a portable amplifier that operates over the 100 MHz to 18.0 GHz frequency range. This model provides 40 dB typical gain with a minimum OP1dB of +24 dBm. This amplifier features an illuminated push button On/Off switch in a small package (3.0" x 3.0" x 1.75") with Type N connectors. Gold plated finish.